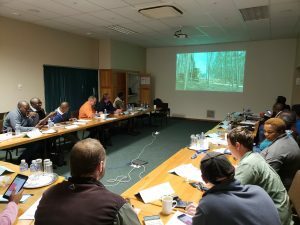 Stellenbosch University in conjunction with the South African Forest industry has developed a robust and internationally aligned Time Study Standard and Data Repository Protocol for use by forest managers, practitioners/contractors and researchers. As part of ongoing support for forest operations The Forest Operations Productivity Initiative includes several machine and systems costing models which will also soon include silvicultural operations as part of the overall forest productivity package. The objectives of these efforts are to improve, if not optimise, silviculture and timber harvesting operations in the face of ever increasing international competition and to provide planning tools to not only the South African Forest Industry but to international partners as well. Parts of this site are still under construction. Any feedback is welcome at this time. Please see our contacts page to get in touch. Successful Time Study Training Short Course 3 – 4 May 2018! A short-course on time studies was held at the ICFR in Pietermaritzberg from the 3rd and 4th of May 2018. The course was very successful hosting 20 attendees over the two days. Big thanks to all attendees and to the organizers of the event! An Android-based Time Study app has been developed and can now be installed here. The app is designed for Android-based smartphones running version 4.0.3 or higher. Video tutorials demonstrating how to install, use and process data from the app have also been developed to assist users and can be viewed on our tutorials page. Need help planning or executing your time study? Find step-by-step instructions assisting you through the process on our Executing a Time Study page. Fill in this form to let us know what you need help with and we will do our best to assist you.